Creating of our dream home is not a single task. We have to put big amount of time and effort for that. In many ways we have to accomplish the aims with more accurately and efficiently. We have to discuss our needs and wants to your designer he can point out that what to be included and what kinds of iopinos are excluded. He can make feasible project within your expected budget. Simple house design needs limited budget. We can make most modern house in low budget. Now the cost materials are very high. So proper allocation and planning is inevitable part of home constructions. A good experienced designer can make transform our dreams in reality. He knows how to allocate and make the home more effectively with satisfying the needs and wants of the people. The contemporary style house need large amount but through proper planning we can make small modern style house in low cost. It is one of our previous works. It is a simple house design. Total build up area of the house is 1515 and sufficient space is allotted for future expansion of the house. You can make good discussion with your designer and to finalize your ideas and needs with him. So he can make your dream home. The 3d plan of the house final view of the house. The exterior design of the house is very attractive. The exterior of the house create first impression in the minds of the people. Proper planning of the interior and exterior designing change overall look of the house. Many ideas and techniques are implemented to create beautiful house. Kerala low cost house designers are focused on creating such beautiful house within the limited budget. 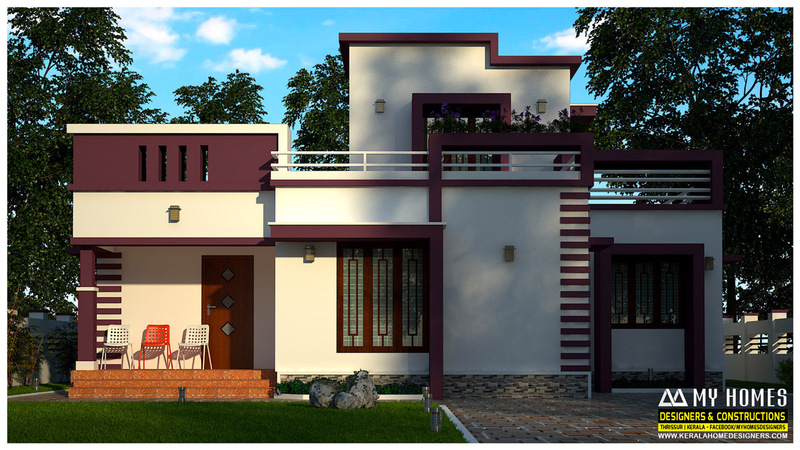 It is very beautiful and attractive, low budget house design for middle class people. It is single floor house design in Kerala. Three bedroom single floor house. It is modern style house in low cost construction. The master bedroom is attached toilet within built shelves; the other rooms are also attached and spacious. The heart of every house is kitchen the modular kitchen with store room is also arranged. The house is constructed with all amenities needed by a middle class family. The cost incurring is controlled by taking various measures. So you can create your dream home within the specified budget. many of the people thinks that it needs higher cost but we can construct your dreams within your constraints.